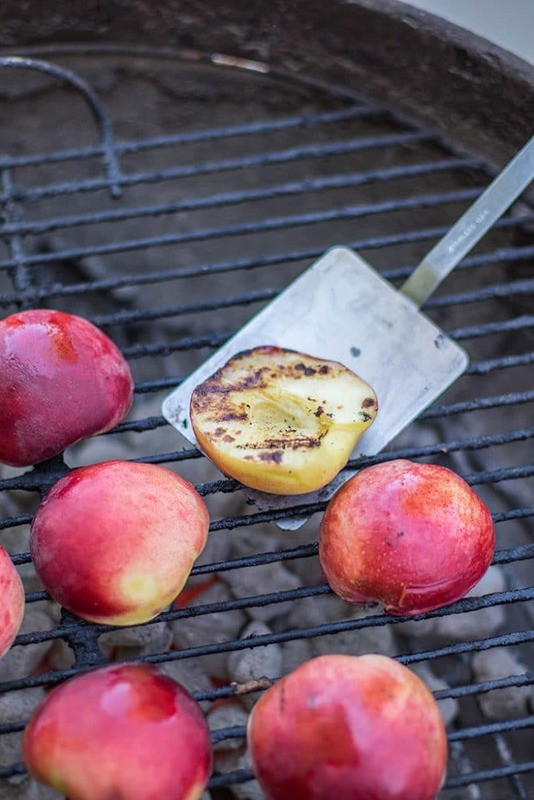 These simple Serrano Honey Grilled Peaches are an elegant (and healthy!) summer BBQ side dish. I made these with a Serrano Honey Vinegar, but if you can’t get your hands on a bottle, I have recommendations below. Disclaimer: I received free product from Capizzano Olive Oils & Vinegars, but this post is not sponsored. I chose to use their products in this post because I am thrilled with the quality and genuinely enthusiastic about their products. A few weeks ago, I posted this Grilled Peach and Vegetable Pesto Pasta, which has so far been my most popular recipe this year! Either everyone is just ready to break out their BBQs, or everyone is excited as I am about grilled peaches! It’s still a bit early for the really good peaches, but being able to get fresh peaches, even from Mexico, is a real treat after living in SE Asia for so long, where the passionfruit and dragon fruit were plentiful, but berries and stone fruit were not. It won’t be long until the Oregon peaches are here, and you’ll want to use them in every way you can. Fresh is ALWAYS good. I love slicing fresh peaches into cereal or onto a waffle. Then, there are always great dessert options with peaches (like this peach adorned Fruit Pizza with a Gingersnap Crust). But how about incorporated into meals? Grilled peaches are delicious with a sprinkle of cinnamon and topped with frozen yogurt, but when I recieved a package of premium, gourmet olive oils and vinegars from Capizzano, and saw the Serrano Honey Vinegar, I knew that was destined to be drizzled on grilled stone fruit. I imagine this recipe would work perfectly with plums, apricots, or nectarines as well (I’ll report back!). 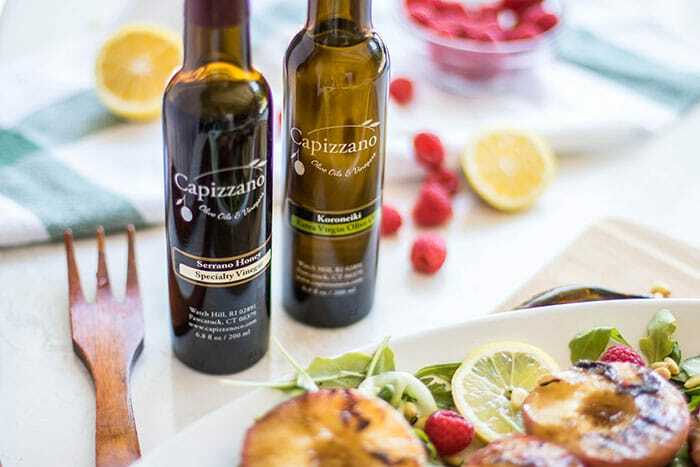 Serrano Honey Vinegar is a specialty product from Capizzano Olive Oils and Vinegars. If you’re looking for some amazing, premium quality olive oils or vinegars to flavor otherwise simple summer meals, I highly recommend these! I am so happy with the, I already had decided they are going on my Christmas list for several food-loving friends and family members. 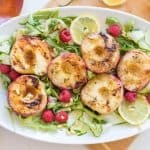 If you don’t have the recommended vinegar, but would like to try the flavors of this Serrano Honey Grilled Peaches recipe, sub white wine vinegar, and add 1 tablespoon honey. Cut a few slices of a serrano pepper, and add them to the dressing, and leave to soak for up to an hour to release some of the chili oils into the dressing. Remove the chili slices before dressing the salad. For the Family: The vinegar isn’t very spicy, but does have a more “adult taste.” I gave Xander a grilled peach that was just brushed in olive oil, and he loved it (he loves all fruit, so it wasn’t a surprise!). Heat the grill over high heat. Combine olive oil and vinegar in a small bowl, and mix well. Brush over halved peaches. Add lemon juice to olive oil and vinegar mix, and set aside. On a platter, add arugula, and then use a vegetable peeler to make long strands on zucchini. I peel around the zucchini several times, but the softer core with the seeds, I chop up and freeze to use in smoothies. Once the grill is very hot, add the peaches cut side down, and grill for about 5 minutes. Remove from grill, and add to platter. 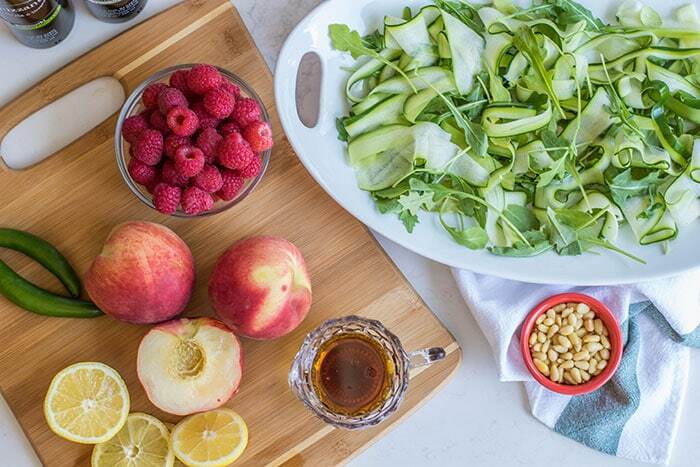 Garnish with raspberries and pine nuts, then drizzle with the prepared dressing. *It's important the peaches are ripe enough that they are sweet and delicious, but on the slightly-underripe side, so they do not get mushy or stick to the grill. **If you don't have the Serrano Honey Vinegar, but would like to try those flavors on this dish, sub white wine vinegar, and add 1 tablespoon of honey. Chop a serrano pepper, and leave the rings of pepper in the dressing for an hour, then remove before serving. These will leave a subtly spicy flavor to the dresing similar to the infused vinegar I used. Oh my gosh, Michelle, these are absolutely mouthwatering! I have this beautiful vinegar and I will be using it. Your photos are awesome and make me want to fire up the grill right now. Nothing like summer grilling and you've given me a delicious recipe! I have got to get some of this vinegar! Wow! Peaches are my favorite summer fruit, but I love this preparation! My husband is going to go ga-ga over this one! I'm glad this recipe works well for both of you! The Serrano Honey Vinegar is so good-- and so sweet all on it's own, so easy to use. 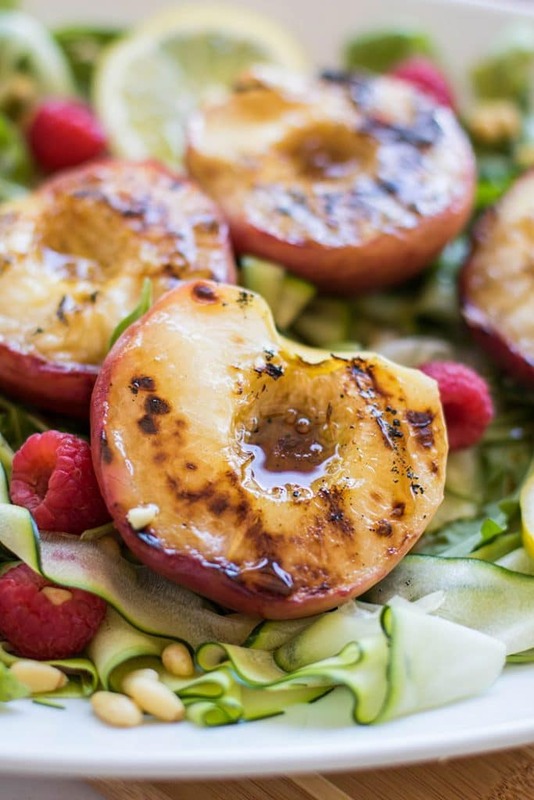 Those grilled peaches look incredible! 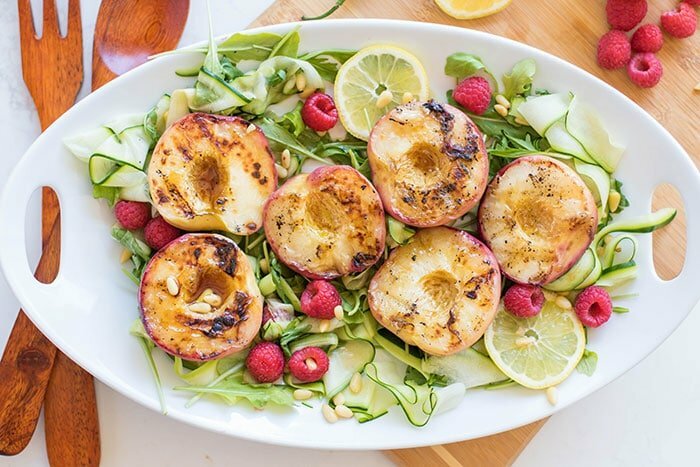 Love the combination of the peaches with the zucchini and rocket - what a delicious summer salad! Grilled Peaches are my fav! and so much flavor you bring in here. I need to get my hands on that vinegar bottle. It's really so delicious, and makes flavorful dressings so easy! I love grilled peaches at this time of the year. It just screams summer! Yes! I am so ready for all the summer produce! I've just started grilling fruit, but I haven't tried peaches yet. These sound amazing....especially with a little serrano honey vinegar! Sweet, spicy, and grilled? You know that must just taste amazing! Wow! This is interesting. I have never tried grilled peaches. I am used to consuming it fresh from the can. Would love to try this with cinnamon and vanilla ice cream instead of yogurt.